The dapper antiques dealer, Armand Fontenot, who became first friend then partner of the New Orleans private detective Moses, has a mystery of his own. Following the murder of Byron Jazzwell, a paperweight is found which reminds him of a piece of jewelry his grandmother had, given to her by a woman, Lucretia, who had been nanny in the household but who later burned down the family mansion and was hanged for it. Curious, the pair recover a box which had belonged to the grandmother which contains not only the jewelry piece but also a journal and things become even more strange. Why had the nanny done what she did? Why did she seem to go through mood swings after visiting New Orleans. And who were the men Lucretia warned the grandmother about when she left her the jewelry the day she died? As Moses and Armand look into it, they find that someone wants this kept a secret an hundred years after the event as other deaths occur and their lives are targeted. Full of atmosphere, humour and great characterisation as well as an intriguing mystery, this new series starring the delightful Armand is off to an excellent start. Not so much voodoo but plenty of mahem. And Mose is his usual bombastic self. And this time the curious couple really do not have any idea of what it's all about. Nicholas Patrella again narrates with passion, seamlessly incorporating the French and Italian phrases into his reading. Occasionally overlong pauses are sometimes a slight distraction but Patrella is so deeply ingrained as the reader of these books, his voice a fine reflection of the stories, it is hard to imagine anyone else taking the part. Add to this his distinctive voicings of all of the other protagonists and it adds up to a memorable performance. 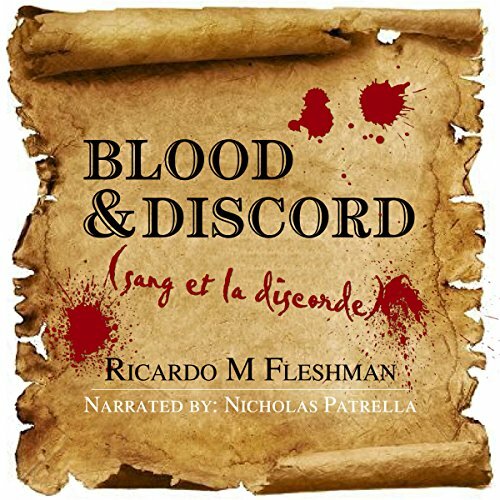 I requested a copy of Blood and Discord having previously enjoyed other Moses books by Mr.Ricardo Fleshman and was fortunate to be sent a complimentary copy by the rights holder, via Audiobook Boom. Many thanks. This is a series I will continue to follow with great pleasure. This review is given entirely voluntarily. I really wanted to like this book. Everything takes place in southeast Louisiana, which is like a trip home. I liked the two main characters, and the antiques dealer reminded me of some real-life ones I’ve known. The narrator did a really nice job overall, in spite of some rather odd mispronunciations. (Pontchartrain is pronounced just like it’s spelled except that the first r is silent. Archangel has a k sound, not a ch sound.) Picky, picky, I know, I just found these and a few more commonplace words oddly abused when Patrella did such a good job on the accents. New Orleans people don’t sound anything like the way most narrators voice them. Patrella came really close. My problem is with the plot. Derivative conspiracy theory, poorly drawn. Fleshman would do better to work on his comic timing and forget the secret society garbage that has already been over-used by better writers. I was voluntarily provided this free review copy audiobook by the author, narrator, or publisher. This book was pretty good. The story sometimes went a bit in too much detail. The narrator did a good job telling the story. The end of the story did leave me interested in finding out what happens next in the characters next adventure. Good start to a series. The story overall was entertaining, fun, interesting and enjoyable. It kept my attention from start to finish. For a shorter book there is a lot packed into it. The story is a much deeper mystery than I first thought it would be. It took a turn I wasn't expecting when I first started the book, but it just made the story more suspenseful and intriguing. The ending seemed a little rushed and flat after all the buildup. You don't get all the answers to the mystery. It is the first in a series so it leaves an opening for the next book. I'm interested to see where the mystery and story go from here. Great characters with a creative and interesting storyline. Nicholas Patrella did a really good job with the narration. Pleasant voice. Clearly spoken. Good character voices. Good accents for characters. He was able to bring the characters emotions to life through his narration. His narration fit the story, calm when necessary, faster when the characters were excited or in a hurry. Although the narration doesn't always flow smoothly and there are awkward pauses occasionally. Mispronounced words occasionally or maybe it's just a matter of what part of the country you come from as to how certain words are pronounced. I was given this free review copy audiobook at my request by the author, narrator or publisher and voluntarily provided this review. Great Expectations, Not my cup of tea. People with a more serious mindset on story content. For me the most interesting thing about this book was the description. The least interesting for me, was perhaps the narrator...Not sure, I just could not get into it. It would peak my interest one moment, but then the flow would just stall me out. I guess (being from Louisiana) I was expecting something of a different flavor. I don't really know. All I know is I could barely keep focused on the story because the reader just left me flat. What character would you cut from Blood and Discord? Not one...It has the potential of being a great read...Everything is there that would make it great. Just something askew. Not being an Author by any stretch; I could almost relate to the Characters. Some books are just not meant to be listened to I guess. I have seen the other reviews, and there must be something wrong with mine because no one else has had the same experience as I did. I am very grateful to the author for sending me this book and hate to not have enjoyed it...Sorry. You did want an honest review. Antiques dealer Armond and Moses the detective are trying to explain the mystery of an 80 year old arson - and these weird brooches keep showing up at every turn... something is afoot! Lovely quirky characters with great voices (courtesy of the narrator Nicholas Patrella) roam around the 1974 New Orleans and make this story lively and entertaining. So short, though! Just 4,5 hours! Gimme more Armond mysteries, please! This is a spinoff of the author's 'The Detective Byone' series, which I haven't listened to (yet) - but it hardly mattered. I enjoyed this book and its narrator a great deal. The promise that there would be more to come. Yes. The short format adopted by the author was ideal for the subject matter. I put the earphones on and next thing I knew, the audible announcer was hoping that I enjoyed the book. Good narration can make s mediocre book great but bad narration can drag a good book down. I liked this Narrator..a lot. His dramatic forays into anger and violence were first rate. But the performance needed an editor. There were numerous mispronunciations of words that snapped the listeners concentration back into the present. All would have been easily remedied with an editor's lite touch. What did you love best about Blood and Discord? What was one of the most memorable moments of Blood and Discord? The initial search for what happened, the seed of the mystery - I'll have to leave it at that. I love the ambience of the story. That's the appeal for me. The character and plot within the setting. A sense of being well entertained. I always react well to that. This is an introduction to an existing character prominent in Ricardo Fleshman's Byone series. It's laid back as it develops into what I hope will become a fun series. Thanks for the listen and letting me review it! I received this book at no charge in exchange for my honest review via AudioBookBoom. Would you try another book from Ricardo Fleshman and/or Nicholas Patrella? I loved the scene setup in this book. In the initial chapters where we are being introduced to the different characters and their world, the author gives a picturesque description of the world and draws us in. The characters themselves look interesting. But as the story progresses, I kept losing interest in it. It didn't hold my interest for long. Several plot points sounded too cliched as well. I did get the second book of this series as well. So, I did try another book from the author. The reading speed didn't quite gel with the pace of the story. At places, the narration was quite fast and it was difficult to follow the story. (I was playing at 1x). There were quite a few mispronunciations as well. I loved the scene setup in this book. In the initial chapters where we are being introduced to the different characters and their world, the author gives a picturesque description of the world and draws us in.